Dr Orestis Georgiou, Director of Research at Ultrahaptics, gives an overview of the results of a recent academic study at the University of Nottingham. It suggests that adding mid-air haptic feedback to gesture-controlled interfaces in automotive settings reduces error rates, reduces “eyes off the road” time and is preferred by users. The haptics slider was probably the easiest, because as you moved it gave you a click-click-click feedback. You don’t even need to look, you can kind of feel. So the haptic feedback helps with that. It [haptics] gave me more confidence that I chose the correct number. These were some of the things participants told a recent academic study exploring the use of mid-air haptics to enhance in-car user interfaces. The research was a collaboration between Ultrahaptics and Professor Gary Burnett, Dr David R Large and Kyle Harrington of the Human Factors Research Group at the University of Nottingham, UK. 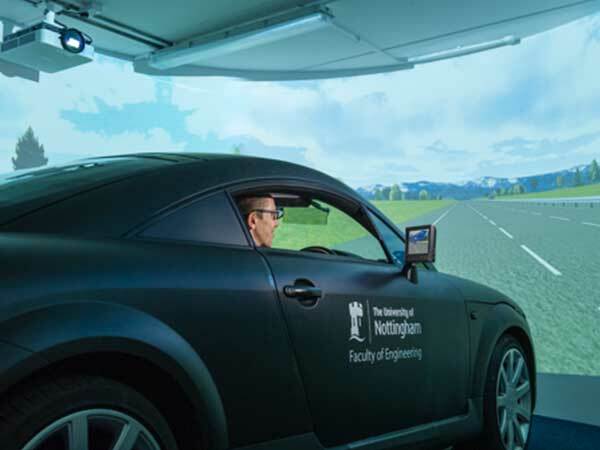 The study used a medium-fidelity driving simulator with a right-hand drive Audi TT car positioned within a curved screen. The full study has been accepted for publication in the Proceedings of the ACM Automotive User Interfaces 2018 conference in Toronto. The results suggest that the participants’ positive reactions to mid-air haptics was supported by data across a range of metrics with significant safety implications. Ultrahaptics’ technology uses patented algorithms to control ultrasound waves, enabling the creation of haptic sensations in mid-air that can be felt by the user (in this case the driver). 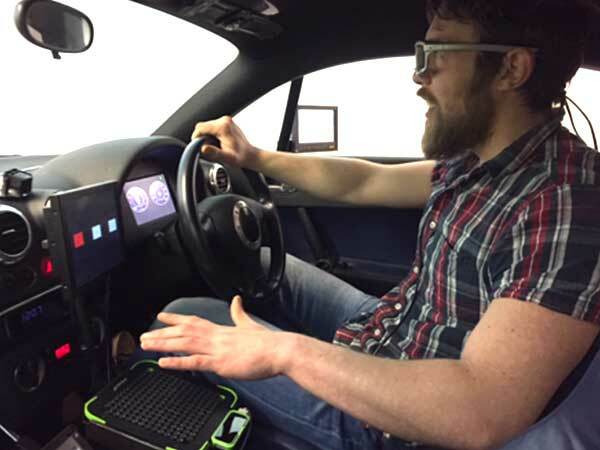 The 48 participants in the study did four simulated drives with four different types of in-car interfaces: a touchscreen without haptic feedback, a touchscreen with mid-air haptic feedback, gesture control without haptic feedback, and gesture control with mid-air haptic feedback. Ultrahaptics’ Touch Development Kit projected haptic feedback onto users’ hands. A dashboard was created using a bespoke application and presented on a 7-inch LCD screen. 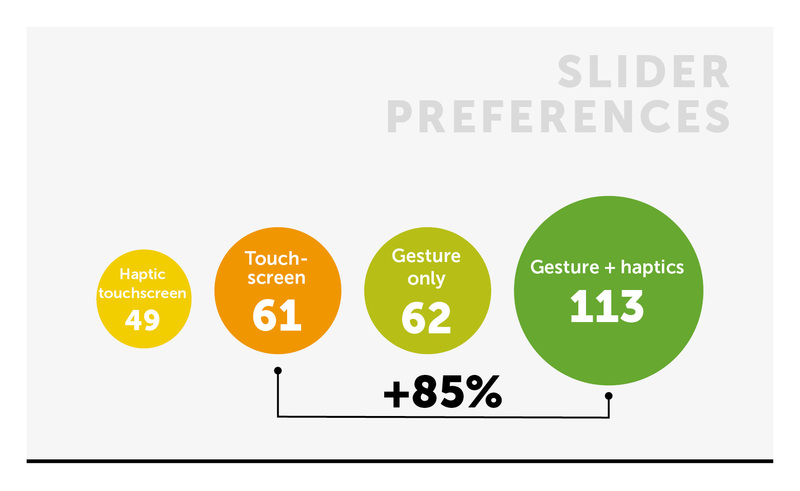 The researchers tested two different types of interactions: a slider bar and button presses. User experience was measured across a whole spectrum, including eye-tracking (“eyes off the road” time), accuracy and efficiency, and participants’ subjective assessment. Results from the full study suggest that adding haptics to gesture control reduced both the total and the mean glance duration times (or “eyes off the road” time) for both buttons and sliders. 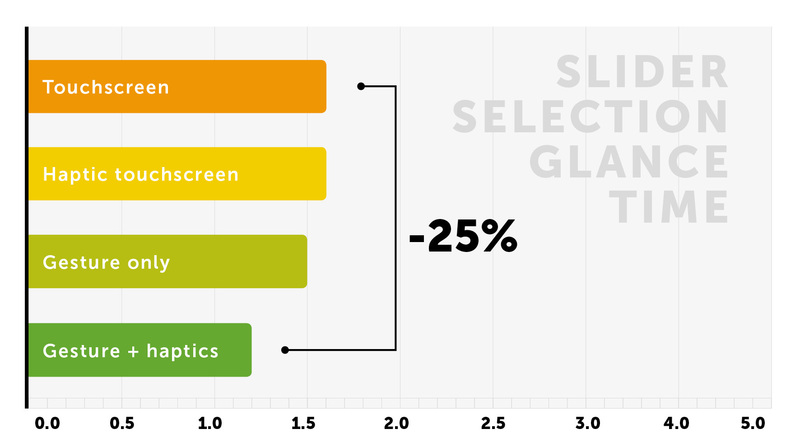 The effect was very striking in the slider task, with gesture control plus haptics resulting in an average 25% decrease in total glance time compared to touchscreens. The mean glance duration was under two second for mid-air haptics for both button presses and slider bars. Reducing glance time improves driving performance and vehicle control, thereby lowering the risk of accidents. For buttons, gesture control alone actually resulted in almost double total glance time compared to touchscreen controls. (One participant said, “Gesture control without haptics was difficult because you couldn’t tell what you were activating.”) However, when ultrasonic mid-air haptic feedback was added, the total glance time reduced to a level similar to that of the touchscreen tasks. The researchers also noted that in the study, for control purposes the touchscreen was visible during gesture-controlled tasks (it showed an abstracted view of the button and slider selections). This could have attracted visual attention even though it was not strictly required. Even more interestingly, 39% of participants (19 of 48) were able to perform tasks with no off-road glances at all. This highlights the potential for using mid-air haptics to create ‘zero-vision’ automotive user interfaces. 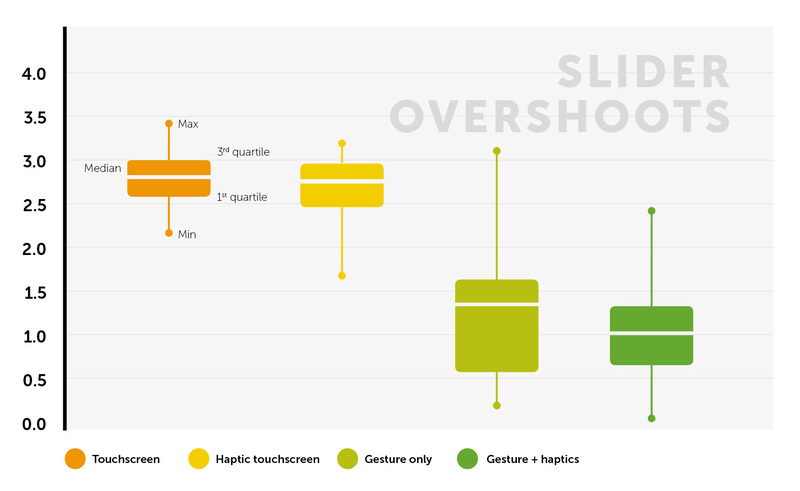 For the slider task, adding haptic feedback reduced the number of ‘overshoots’ for both the touchscreen and gesture control. Gesture control together with haptic feedback resulted in the greatest accuracy overall. Participants were, on average, three times more accurate compared to when they were using a touchscreen. Users prefer gesture control with haptics over gesture control without haptics for both buttons and sliders. For the slider task, the increase in preference was an impressive 85%. This study demonstrated clear potential benefits for using gestures coupled with mid-air haptics in an automotive setting. It showed up to 25% reduced visual demand and a threefold improvement in accuracy. Users also expressed up to 85% improved preference for this mode of interaction. Finally, it is important to note that further improvements are expected with regards to performance, accuracy and glance times as user familiarity with gesture interfaces and ultrasound haptics increases. These numbers are not just an incremental improvement but potentially a massive shift in safety. This initial study is just the start of exploring how mid-air haptics can enhance automotive user experiences, and has unveiled some fascinating research questions. In-car interfaces are an exciting but also uniquely challenging form of user experience to design. If you’re interested in becoming one of the OEMs and tier 1 suppliers currently working with us to explore how mid-air haptics can work within a vehicle ecosystem, or in joining our Academic Program, please contact us. Dr Orestis Georgiou is a researcher and an author of over 60 publications. He leads and oversees Ultrahaptics’ scientific collaboration network with universities and research labs around the world. Discover 6 reasons why haptic technology makes automotive HMI safer, more intuitive and more enjoyable to use in our technology report. Haptics and Emotions | Can feelings be stimulated by touch?